This is the perfect thing if you're cooking for someone who's all about beef with brown gravy. Serve it with some mashed potatoes and you've got dinner enough to satify the heartiest appetite. It absolutely screams "home cooked dinner". Combine all ingredients in a large bowl. Shape meat mixture into oval shaped steaks, sort of like flattened miniature meat loaves. Place steaks in a shallow casserole dish that has been sprayed with nonstick cooking spray. Bake uncovered for about 30 minutes or until the steaks are slightly firm to the touch. 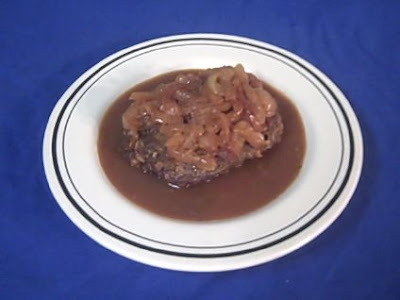 Smother each steak with caramelized onions and serve in a pool of brown gravy.